Home » Featured Articles » Letter from the Field to KFWH Students! Letter from the Field to KFWH Students! 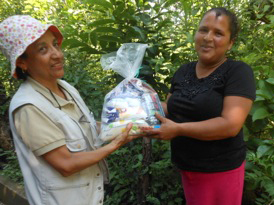 This letter was sent to Dr. Dorn by a local worker named Antonieta to thank Murray Avenue school for supporting women with nutritional packets while being treated for Chagas disease in Guatemala. Gracias a tí Patricia por el cariño que le tienes a Guatemala y su gente, pronto entregaremos en Chiquimula. POR FAVOR EXPRESALE NUESTRO AGRADECIMIENTO A LOS NIÑOS QUE APOYARON ESTO, HAN DADO MUCHA ALEGRÍA A MUCHAS PERSONAS. “Thanks to you, Patricia [Dr. Dorn], for the love that you have towards Guatemala and its people. Soon we will deliver over in Chiquimula. PLEASE EXPRESS TO THE KIDS OUR THANKS FOR SUPPORTING THIS. THEY HAVE GIVEN MUCH HAPPINESS TO SO MANY PEOPLE.